Cadence, an EDA (electronic design automation) company, buys Valid Logic Systems (also an EDA company), where I was the Interaction Design Lead for a team of five UI engineers designing and building the interface for IC (integrated circuit) layout tools. It’s 1992 and Cadence is criticized by their customers for the difficulty of their software and they want to improve usability. Usability as a field was very new, beginning to emerge as a distinct professional practice in the late 1980s. The UPA (Usability Professionals Association, now UXPA) was founded in 1991 and I attended their first conference, held at Microsoft in Redmond, WA in 1992. As a young designer and UI programmer, I was surprised to learn that I had been practicing usability engineering – assessing and making recommendations to improve usability – without realizing it, for most of my career. Electronic design automation – tools for designing printed circuit boards (PCBs) and integrated circuits (ICs) – as a field had been populated by the hardware engineers who needed the tools. The guys (and they were nearly all men) who designed the tools were the same ones who used them and they understood the computer inside and out. But by the late 80s and early 90s, computers were becoming increasingly complex and engineering disciplines were specializing in either hardware or software design so that the engineers who designed the tools no longer knew the domain thoroughly and the hardware engineers no longer understood every function of the computer. Hence the new need for usability in the field of EDA. The usability profession is new and the need for it in EDA is new, so how do you introduce usability as a discipline into a traditionally engineering-oriented organization? When Cadence bought Valid, each organization had a team of 5-6 people developing the user interface for their respective EDA products. Myself, the manager of the Valid team, and my counterpart at Cadence, Jeff Markham, founded the new Usability team. At first, it was just the two of us evangelizing usability. At first we did a lot of research and reading about usability. Then we brought in several usability professionals to teach classes for us and others at the company interested in improving usability. We realized that in order to raise awareness, we needed an early win. One of the projects we were engaged in was improving the installation process for our PCB tools. We found an empty room with a “computer closet” so we could set up a camera in the room where the user would do the installation and run the wires to the adjoining closet and the observers could watch on a separate computer without being seen by the user. The installation media came packaged in it’s shipping box and so, at the last minute, we decided to start the usability test by asking the user to open the box, retrieve the media, and figure out, from the contents of the box, what to do. Usability testing the installation process starting with opening the shipped product. Usability testing can be applied to almost any aspect of product design – from the acquisition experience through product end-of-life. The shipping box contained 2 (TWO!) “Read Me First” documents containing slightly different, and sometimes contradicting, information. But imagine the customer support calls this initially generated. On top of that, the Read Me First documents were on the top of the stuff that came in the box, the user had to pull everything out of the box to discover them. Resolution: Easy – combine information into a single Read Me First. Put on top. The customer received 10 (TEN!) – 2×2’ boxes when they ordered a copy of our tools – 1 contained the magnetic tape with the installer and getting started instructions, the other 9 contained the product documentation! (Okay, this was normal before online documentation. However, none of the boxes were marked with anything but the company information, forcing the customer to open each box until they found the one with the installation tape. Resolution: Print one box “Installation Materials” on all sides. Many installation issues that revolved around making the user type information that the system could find and set as defaults. Set defaults for all fields that was asking the user for information they system knew. 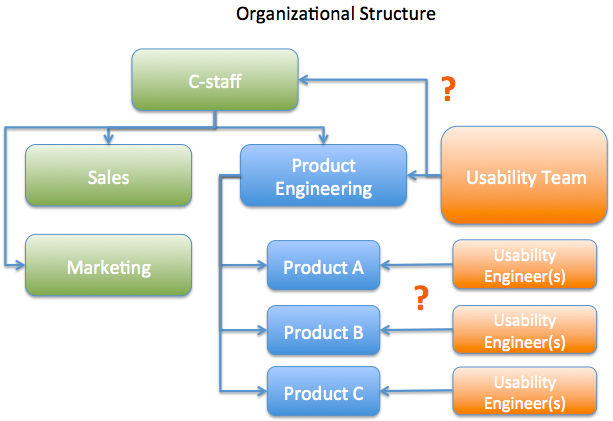 We studied various ways that a usability team could fit into the organizational structure. 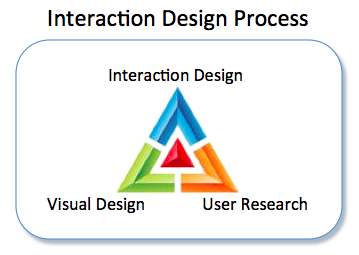 Like tech pubs or QA, usability (and user interaction design) are cross-functional disciplines. It is now well known that there are two basic organizational structures for such cross-functional teams – a corporate entity whose services are either “free” or are charged back to the departments, or embedded with the product teams they service. What is not so well known is which one works best. I have found that this really depends on the organization. Most organizations I have worked in tend to switch back and forth between these two models every few years searching for the best place. Where does the usability team fit into the organization? Published as much as possible – tri-fold explaining our team’s function and articles in the company newsletters. It helped the company move beyond the need for customers to be highly expert at the products. With a new level of usability, it was possible to sell to a broader set of customers. Organizational issues are situational, there is no one-size-fits-all. While I was at Cadence, the usability team switched between a corporate entity and part of the product teams more than once as part of general reorginzations. As the needs (and size) of the organization changed, reporting structure changes were necessary.